And, it’s worthy of use by the Woodchuck of Winter Predictions, Punxsutawney Phil! It’s DEsect, our 100% diatomaceous earth (DE) insecticide for fleas, and other bugs. DEsect insecticide is effective for use on all types of animals, not just groundhogs. Most of our sales are for ranch & farm, dogs, cats, livestock and poultry, but we're sure glad to have the world's most famous groundhog as a fan. So, how did Groundhog Day really start? According to folklore, a groundhog's behavior can predict the weather. A sunny day that allows the groundhog to see his shadow will send him scurrying back into his burrow-a sign of six more weeks of winter. A cloudy day where he doesn't see his shadow is a sign that spring is near, and the groundhogs can stay above ground. Punxsutawny, PA held its first Groundhog Day Celebration on Feb, 2, 1887 and it's been a big event ever since. A little more about why Groundhog Phil will love our DEsect DE insecticide. Diatomaceous earth is deadly to any insect. And, bugs can't become immune to its drying action on their exoskeletons. It's OMRI listed for organic production. DEsect controls fleas, flies, ants, and a whole list of other bugs that might "bug" Phil. Phil can dust himself with the DE and also use it in his burrow and sleeping area. DE's mode of action for insect and parasite control is strictly mechanical. The microscopically sharp edges contact the insect or insect eggs and pierce their protective coating, so they soon dehydrate and die. 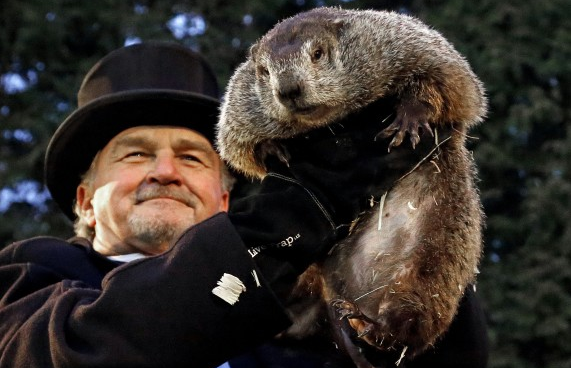 We'll all be watching on Saturday to see what groundhog Phil's prediction will be. I'm hoping for a cloudy day at Gobbler's Knob!